Do you know how long I have been waiting for this day to jump up and down with joy and shout from the top of my lungs THE KITCHEN IS DONE!!! It has been a LONG 22 months since the day we found the mold. So to say I am just a tad excited to bring you today’s post is a huge understatement! So here it is, our white and elegant kitchen remodel. Let’s take a step back in-case this is your first time here, if so, welcome! 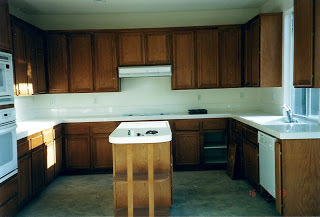 15 years ago we bought our house and this is what our kitchen looked like (minus the floor). 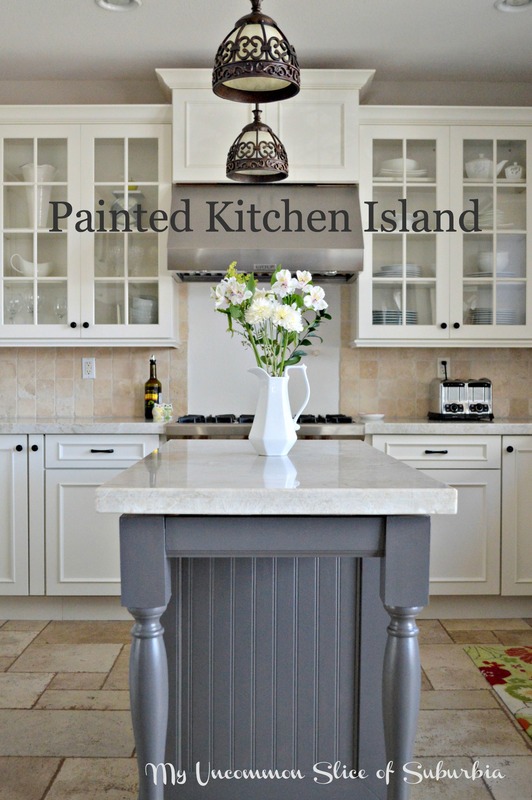 6 years ago we took the builder grade kitchen and upgraded it by painting cabinets, adding molding, changing out light fixtures and hardware, rebuilding the island, you name it we did it. We were so proud of all of our work and I absolutely loved how our kitchen turned out. 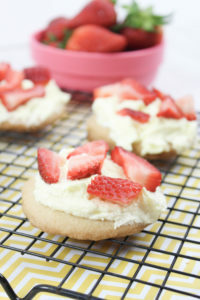 If it weren’t for our kitchen, I wouldn’t have this blog. Back in January 2013 we found something that completely devastated us, MOLD, and it was everywhere. Almost our whole kitchen was a complete loss and insurance would not give us a penny. Lets be honest my husband is as handy as they get and I can paint cabinets but we sure can’t build a complete kitchen. Over the next year we sealed off the cabinets, refinanced the house and began rebuilding in January 2014, 1 year later. The most difficult aspect of designing our kitchen was keeping it cohesive with the rest of our home and to make the old work with the new. Anything that was salvageable we kept to save us money. It would have been a heck of a lot easier to start from scratch but there was no way our budget was going to allow for that. I remember in the beginning, a design lady had told me there is no way I was going to pull off what I wanted with all the warm tones we already had going on. You guys kept me motivated and told me not to listen to her and I did. I’ll admit, I had breakdowns, I doubted myself, their might of been a few tiffs between Ray and I but you know what it worked and we couldn’t be happier! Our cabinets are Kraft and we purchased them from Lowe’s. The cabinet panels are square and recessed in the color Dove, we then added hardware from D Lawless. 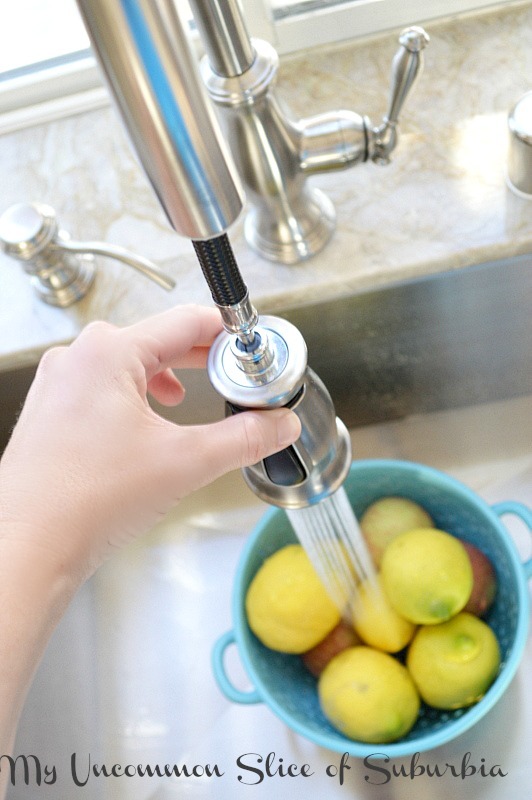 We had our counter tops and farmhouse sink installed and Ray installed our faucet. 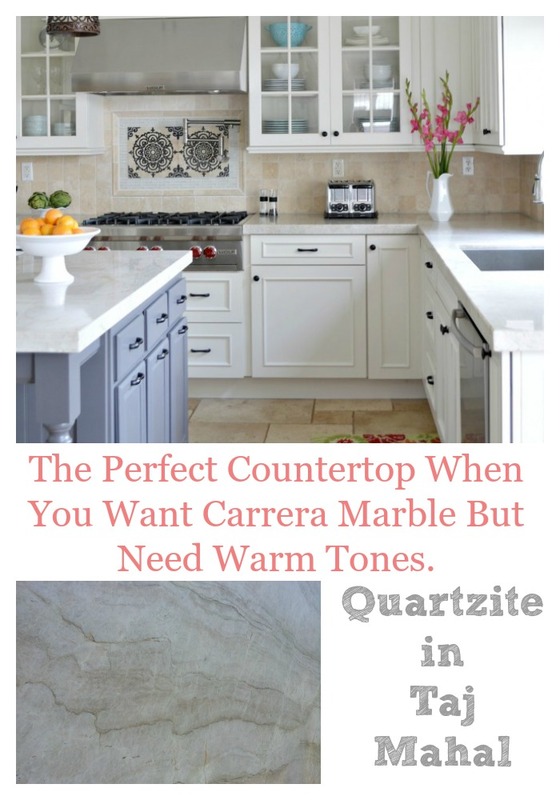 The countertops are quartzite (not quartz) in the color Taj Mahal. I absolutely love them, they are durable and elegant all at the same time. It has a vertical veining, a polished finish and I was able to find 2 slabs with warmer colors vs the cooler colors, perfect! We saved ourselves hundreds of dollars by having the glass cut at a local company and installing them into the cabinets ourselves. You can read that tutorial here. Lastly, my husband framed out the window and we added a roller shade to block the sun in the late afternoons. Hopefully I will have the time soon to snap some pictures of the inside of the cabinets. They are deep drawers, pull out trays, spice drawers, knife drawers, and everything keeps me organized! We are so thrilled to have this behind us, thank you so much for all your support and advice over these past 2 years! I have everything listed below but if I am missing anything feel free to leave it in the comments. Faucet: Hanover from Pfister read more about it here. You can find all of our kitchen tutorials for the new kitchen and our old kitchen in my project gallery. Love your kitchen. What brand are the light fixtures over the island and where did you purchase them? Beautiful kitchen! Where did you get the pendant lighting over the island and how much did it cost? Thanks so much. The pendants we purchased when a business was closing, they were not in the box and they don’t have a name. So sorry, wish I could be of more help. GORGEOUS Kristin!! I love all the choices you made!! It was beautiful before and you topped that! Hard work that paid off in the wake of the bad mold news. My favorite thing is the new back splash over the range. Now get cooking, Thanksgiving is coming. Your kitchen is gorgeous Kristin! You must be over the moon to have it completed. Everything is beautifully done. I love the countertops. What a wonderful holiday gift to have a fully functioning kitchen. Enjoy! Your kitchen is gorgeous Kristin!! I know it’s been a long journey for you and you must be over the moon to have it finished. Beautifully done throughout. I love your countertops. What a wonderful gift to have a fully functioning kitchen in time for the holidays! Enjoy! The kitchen is simply stunning Kristin! What a nightmare you all have been through. I love every choice you made! I bet you all are so proud of your accomplishment! 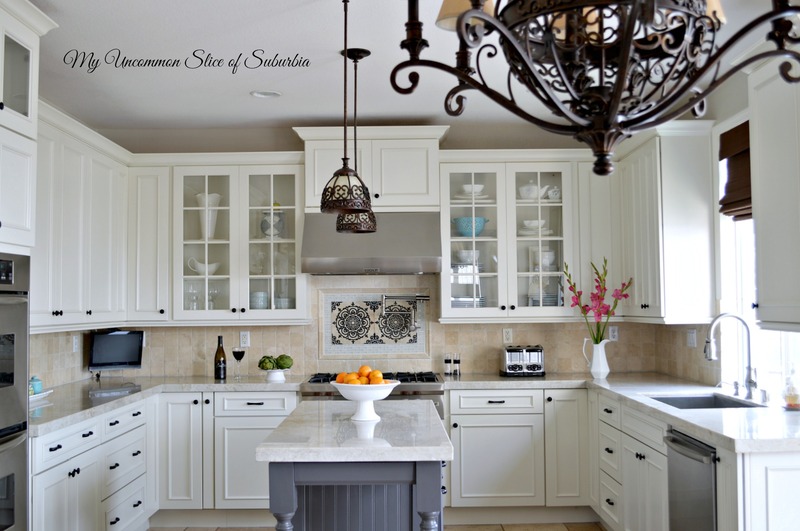 I wish we lived closer so we could pour a glass of wine and hang out in that beautiful kitchen! Great job girlfriend! Kristin – So much hard work but you now have such a beautiful kitchen. I love everything about it. It’s stunning! You must never want to leave that room! What a beautiful tranformation. Sorry to hear you had a mold problem. This kitchen must be a delight to cook in. We also have the versaille travertine in our kitchen. Enjoy the holidays. It’s beautiful! Y’all did a fabulous job! I know how thrilled you must be to finally be finished. I didn’t realize insurance wasn’t paying anything. Isn’t that why we pay insane premiums?? Beautiful…you guys did a fabulous job. Enjoy! It is absolutely beautiful! How wonderful that it is finally done, and now you can enjoy it for the holiday season, and beyond! I love that you followed your instincts and stuck with what you wanted. It is a beautiful, unique kitchen! You did a terrific job. This kitchen will be classical for years to come. We, too, need to renovate but are limited by budget and size of kitchen. What are the floor and island dimensions? You managed to get lost of extras within your original kitchen. 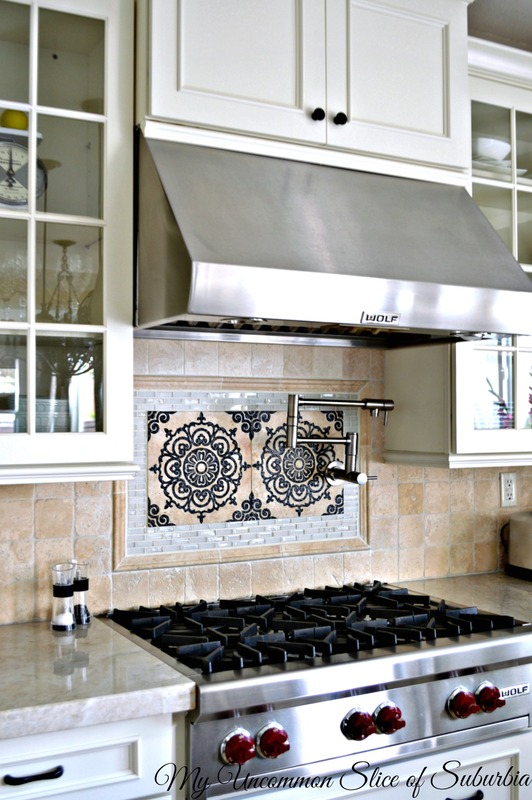 The kitchen is 18 1/2 feet long by 13 1/2 feet wide, this includes where the table is. If you just measure to where the refrigerator ends it is 12 feet long. Oh yay!! I wondered about your kitchen and here it is. It’s beautiful and bright. Love everything! Kudos to you both! It’s really elegant. 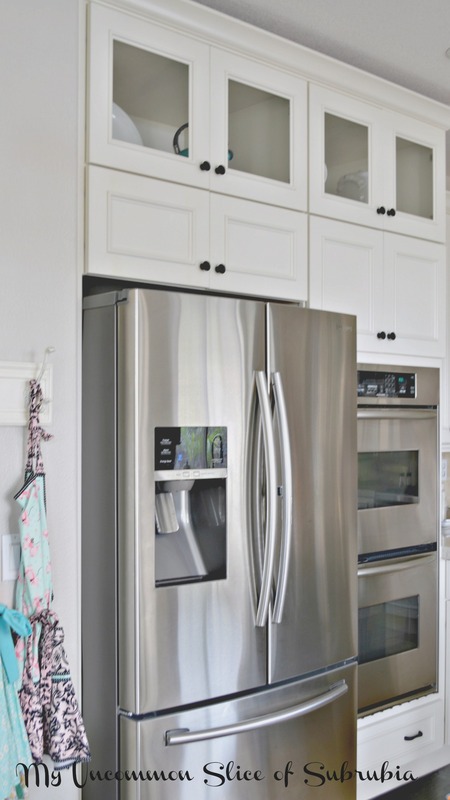 Can you please tell me what is the height of your wall cabinets (the ones with the glass inserts)? Our ceiling is 9 feet and the glass cabinets are 46 1/2 inches tall. I’ve been “waiting” for this! And, WOW … I’m beyond impressed … beyond gorgeous! You guys did an amazing job and have created such a beautiful space with fabulous features (from the gorgeous cabs … awesome backsplash and, of course, your island)! You did it (and, just in time for the holidays, too)! I love the color combo and all the choices you made are excellent. I would love one just like it. Congrats! Gorgeous! I love it. 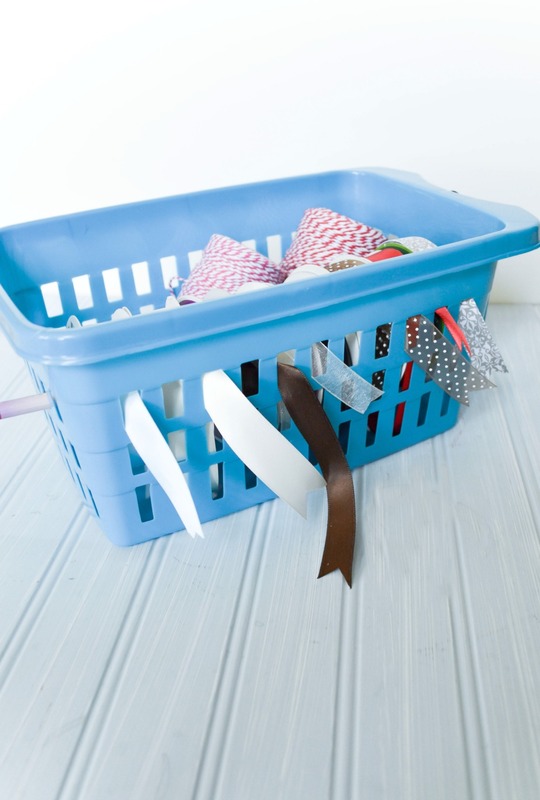 Living through a kitchen reno is miserable–been there. Now we are getting ready for a mini reno and I am dreading it. 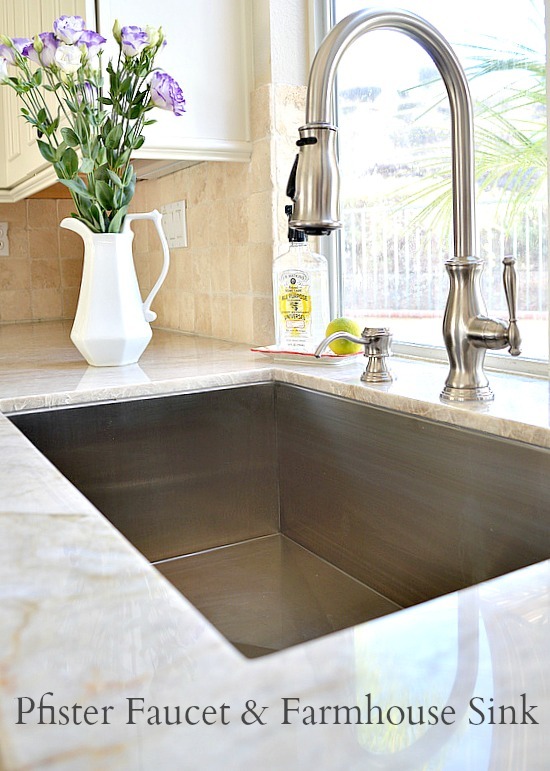 Love the countertops. Incredible job! Congrats, Kristin! Way to persevere!! 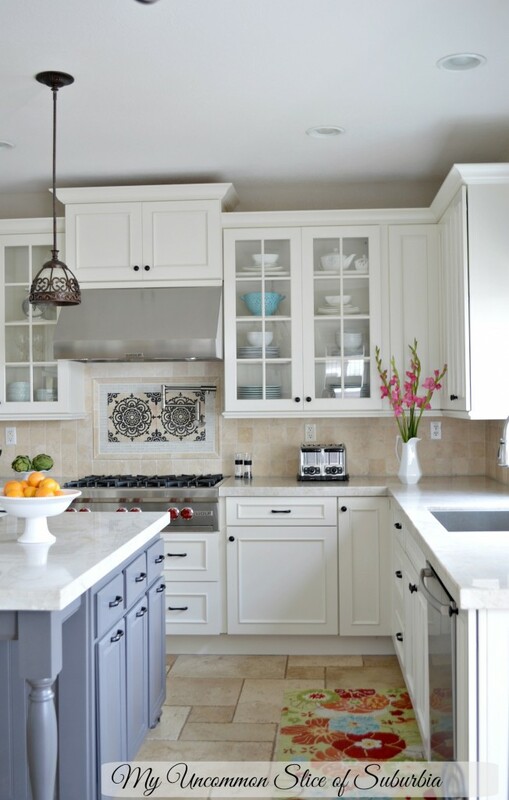 It looks beautiful and I especially love the white cabinets with the smoky gray island. So lovely!! It looks incredible Kristin! So glad you’ve reached the end of this unexpected journey at last! 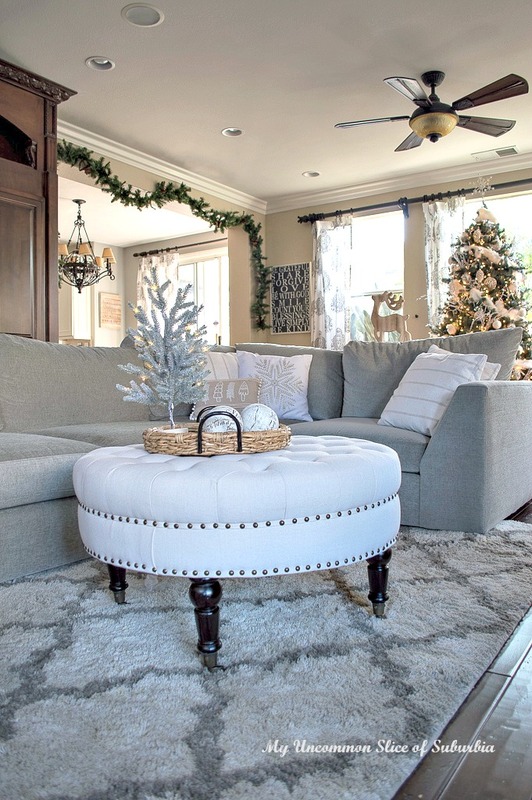 What brand are the light fixtures over the island and the other one you can see on the picture and where did you purchase them? Thanks so much; your kitchen is amazing. 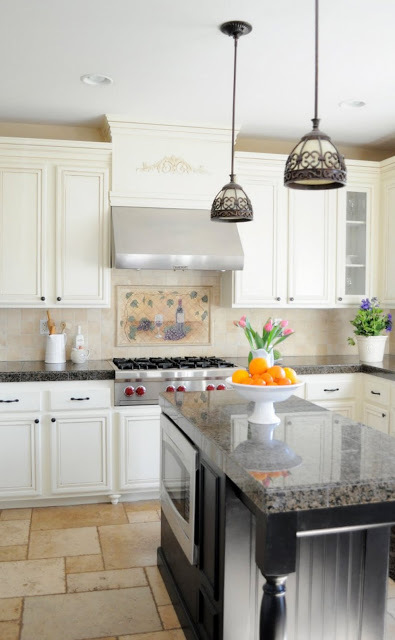 Your kitchen looks great; what brand are the light fixtures over the island and the one in the room next to them and where did you purchase them? I love them! It turned out so amazingly beautiful. Every last painful hour of it. 🙂 I had forgotten we shared the same insurance story. Our kitchen mold wasn’t covered either and we ended up doing a complete gut – floor to ceiling down to the studs – on our own dime. We’re a wee bit jaded when it comes to insurance companies at this point. Debt smedt, a beautiful kitchen came out of the deal, right? 🙂 Congratulations on hitting the finish line. It really is gorgeous. Kristin, it came out beautifully, second time around!! 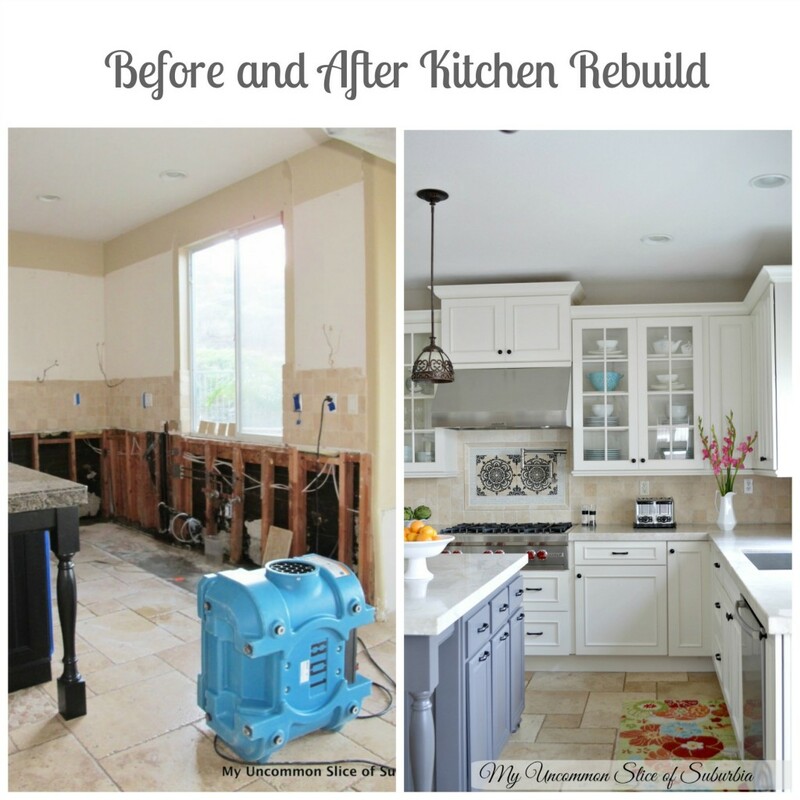 I loved the first renovation too and now you have gotten rid of the mold and added those beautiful countertops, I love how you were able to tie into your warmer backsplash and flooring with that element and still go with with cabinets. Love love love! Enjoy! I’m interested in knowing @ cause of mold & refusal of your insurance co. to pay for repairs. Did you have a pipe leak or faulty plumbing or was water intrusion that caused mold not related to plumbing ? Why did insurer refuse to cover damage ? Did you change insurers ? 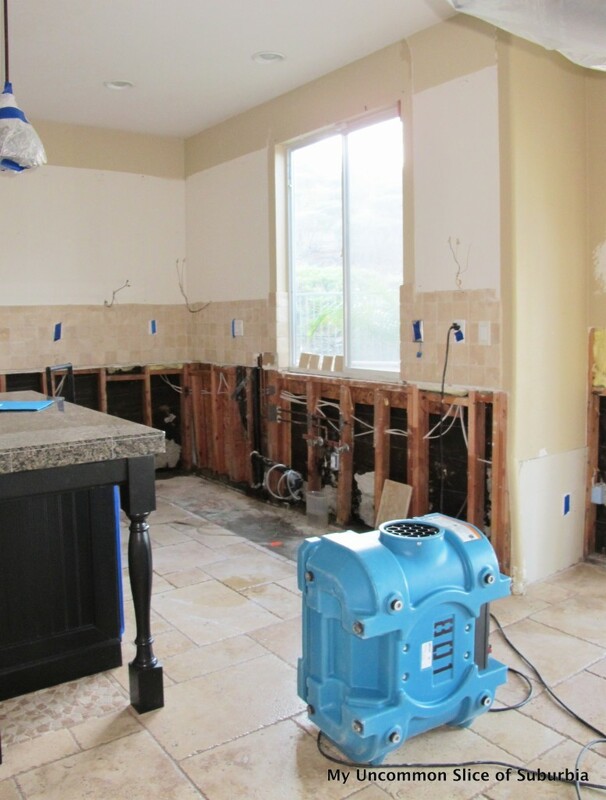 What provisions/language must be included in one’s policy to know that if one’s plumbing fails, damage like yours will be reimbursed by homeowner’s insurance ? Oh Kristin I am so happy for you! Yippee it’s done and it looks fabulous. You guys make such a good team, and I’m so glad you kept your vision despite the ‘designer’ feedback. As I write this we have our bathroom torn up because of a pipe leak and they found some lead and asbestos so it’s been fixed and hopefully the plumber comes tomorrow so we can have water again. It’s life with an older home I guess. The good news is I can fix up that dark awful bathroom at least. Love the way you put everything together! Your sink is FABULOUS. Where did you find it? Is there a model or style name? Thank you & congratulations on a beautiful job! What is the make and model of the pendent lights fixtures over the island? Wow! What is the dimension between the island and the base cabinets? We are trying to decide if we want an island in our kitchen but not sure if there will be enough room to maneuver around it. Amazing job. Hi! 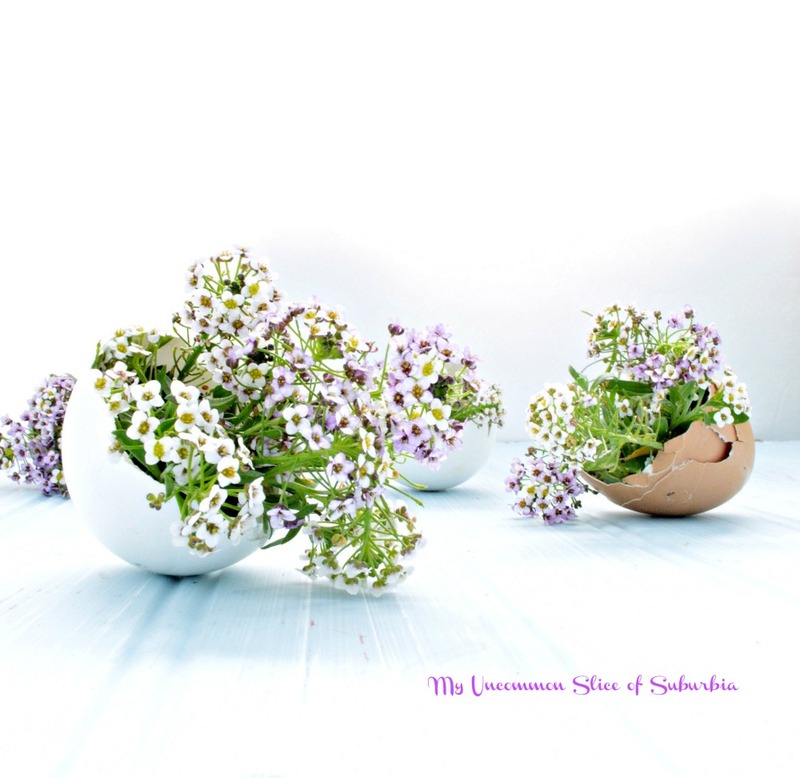 Loving your site! 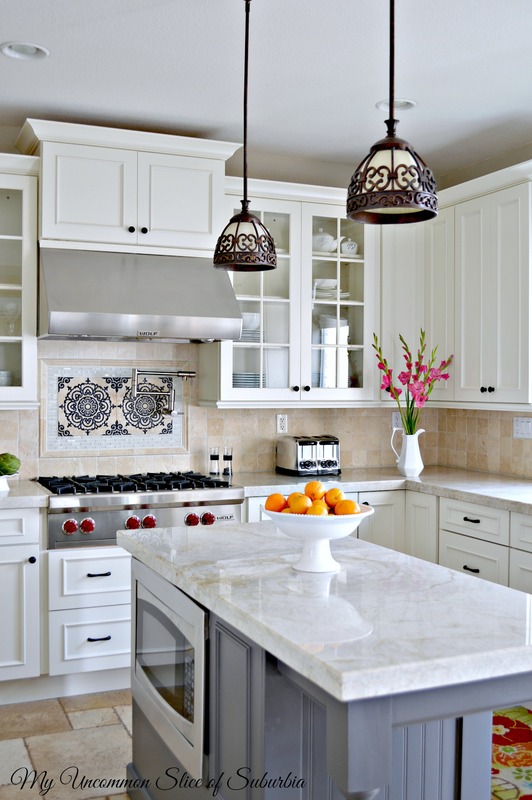 You might’ve already said, but where did you find the light fixtures that are over your island? What brand are they? Thanks! You all did a wonderful job remodeling the kitchen. It’s beautiful! Thank you so much Kaylor! Your kitchen is amazing, and the colors look beautiful together. I’m sorry you had to go through so much stress and craziness, but the end results are awesome! Oh, you guys did a great job!! 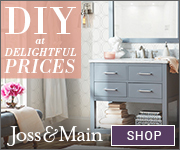 It’s beautiful….I’m new to your site, but I know how hard just doing a kitchen is, let alone dealing with mold…. Sorry about the mold and can’t believe your insurance wouldn’t pay out! Your new kitchen is very lovely. Blessings for a smooth road ahead. Absolutely stunning! What an amazing transformation! Oh honey, as I scrawled down and read and saw your AWESOME kitchen rebuilding I got excited, as we did exactly this five years ago and I still can’t believe how gorgeous it looks. Congrats, your kitchen turned out stunning and it’s the heart of the home and you did a FABULOUS job! Enjoy it for ever. You are so sweet Fabby, thank you! Visiting from the STTA hop. I would never wish mold on anyone in their kitchen, but i’m glad you kept your wits about you and did the remodel, it’s gorgeous! 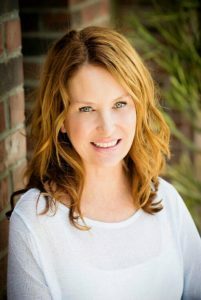 Gorgeous and I do feel your pain with so many projects under our belts as designer/contractors that is our family business. Going to feature this as one of pics from the Share It One More Time Party next week. Oh that evil blue machine! I had one in my kitchen for a few days and celebrated the day it was gone, even though there was still the rebuilding to do. Your new kitchen is lovely. Congratulations on your #HomeMattersParty feature. Thank you Carole. 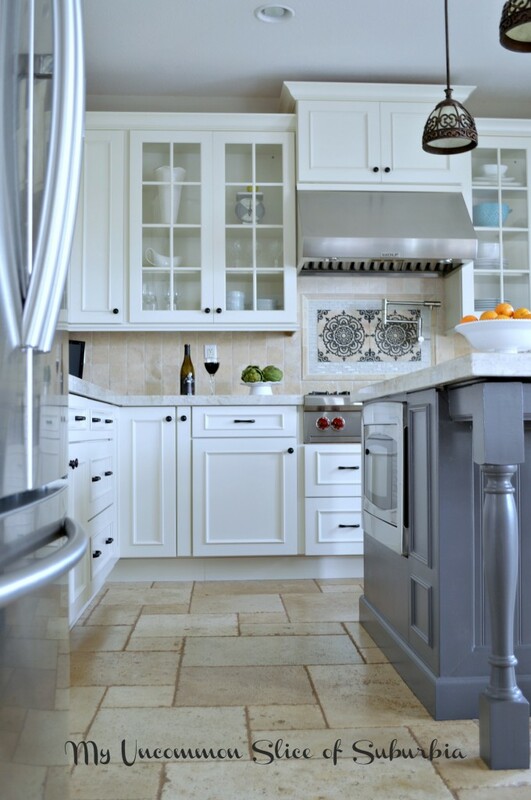 The Backsplash in kitchen is a Durango Cream tumbled travertine. For the paint, we mixed 2 of our leftover gray’s and painted so I can’t give you a true color match. Wow,Kristin.Thank you so much for having a great eye for beauty.I love that blend of colours.Thanks for the determination. Kristin, I just found thus post and you did a fabulous job! I was wondering your thoughts on having a microwave drawer. I a about to do a kitchen reno and that has been presented as an option.